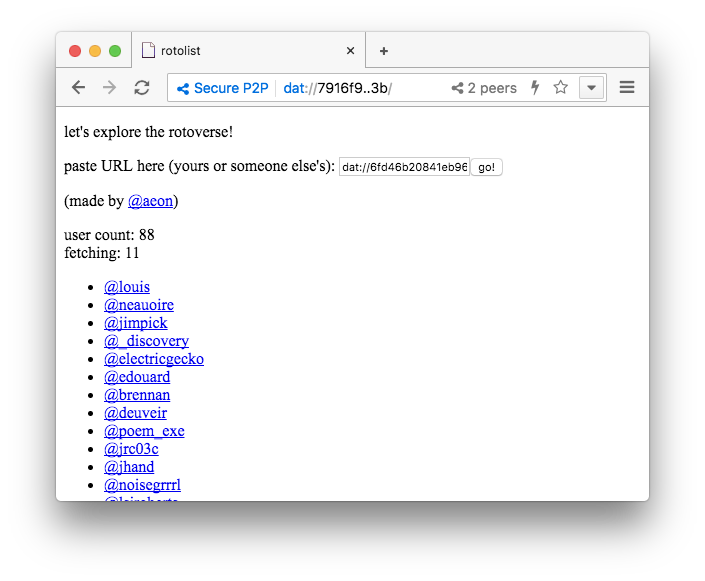 A small community of users accessing Rotonde via Beaker Browser is starting to grow. This is great news! Running applications with Beaker Browser is neat because the apps themselves sit on your hard drive as opposed to a remote server. This means that if you'd like to change what Rotonde looks like, you can simply update its .css files directly. There is a links/ folder inside your Rotonde app directory which contains a custom.css file. You can add new rules or update existing rules to this stylesheet. Small changes can drastically shift the aesthetic of your feed. You can also enable "live reloading" inside of Beaker Browser, which will automatically refresh the page when files inside your app's directory are updated. To do this, click the "lightning" icon to the right of Beaker's address bar. When other users visit your feed's dat:// URL, they will see these changes too. However, this also means that when you visit another user's feed, these changes won't be present, as every user looks after their own copy of Rotonde. A fresh install of Rotonde includes the app's default avatar (display picture). Just like the .css file we edited above, your avatar lives locally on your hard drive, so we can modify or swap it out with another, to help other Rotonde users differentiate between feeds. Your avatar is located at media/content/icon.svg inside your app's directory. Your avatar must be in .svg format, and a general rule of thumb is that it should be of equal dimensions (eg. square, 100x100px, 200x200px etc). Brennan Letkeman has kindly built a repository of .svg packs in support of the Rotonde project that you can also use for free. Jordan Batch has also pointed me towards his generative .svg creator called Mon. Make sure to hit refresh several times to see if something you like is uniquely generated. Posting images and .gif files to your feed is as simple as dragging them onto your feed's commander. You will notice that text is then pre-generated into the commander's input field, which can then be edited. Rotonde assumes any text after the >> double arrow characters will be the filename of your image. Once you begin following other users, your application's feed will start filling up quickly. You can use the commander input at the top of the page to input search queries that will filter your feed down. While the network is still small, Rotonde is growing quickly and users have begun devising ways to discover and link with each other. Connecting with someone is as simple as sharing your dat:// URL with them, and plugging theirs into your own feed. 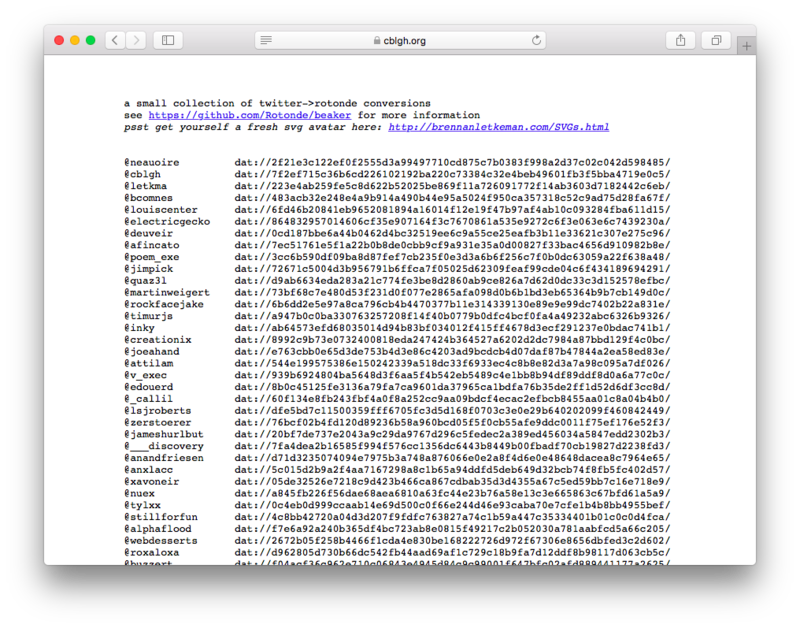 Alexander Cobleigh has begun maintaining a plaintext list of other users on Rotonde that have migrated from Twitter. @aeon/@aeonofdiscord has also created a useful tool called rotolist, which given any user's dat:// URL, will trawl through the network to find as many other Rotonde users as it can.